A monotypic genus of southeastern North America and the West Indies. 227. 1812. 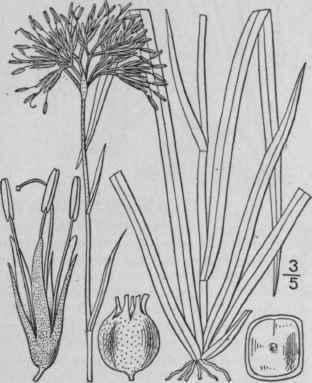 Lachnanthes tinctoria Ell. Bot. S. C. & Ga. 1: 47. 472. 1893. Not Anonymo capitata Walt. Stem 1 1/2°-2 1/2° tall, glabrous below, pubescent or woolly above. Leaves 2"-5" wide, acuminate, the basal ones shorter than the stem, the upper reduced to bracts; panicle 2-5' broad when expanded, dense and almost capitate when young, white-woolly; flowers 4"-s" broad, bracteolate, the perianth yellow and glabrous within; style about as long as the stamens; pedicels stout, about as long as ihe capsule, rather shorter than the bractlets; capsule about 3" in diameter. In swamps, eastern Massachusetts to New Jersey and Florida, mostly in pine barrens near the coast. Also in Cuba. Carolina or Indian red-root. Spirit-weed. July-Sept.